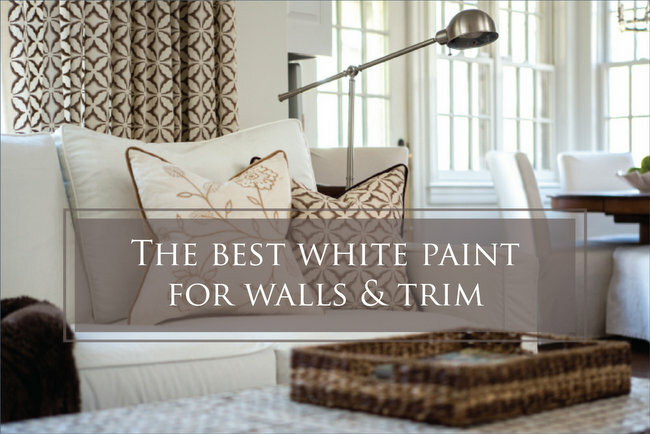 Everyone wants to know the best white paint color for walls and trim – I get this question all the time! You all know how much I like COLOR, but there is a place and time for everything. And on occasion, it’s the place and time for white paint on the walls and trim. This space felt choppy and small because of all the color shifts in the room. Notice all the changes, starting from the top of the photo and going down: yellow family room ceiling, white crown molding (in family room), green room header between family room and kitchen, yellow kitchen ceiling, white crown molding (in kitchen), green wall, white countertop, brown island, orange wood floors. By painting the ceilings, trim, and walls out in white paint, we made the space feel open and larger. Now the same color (white) extends from the top of the photo all the way down to the dark island. Isn’t it much more pleasant and peaceful to the eye? It’s the perfect warm white – it has a very slight yellow undertone, but it isn’t discernable to most. It reads like an ever-so-slightly grayed white. 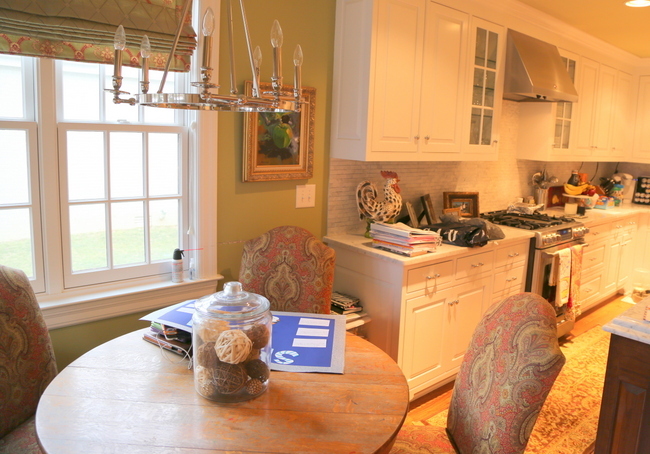 Benjamin Moore White Dove is what we used in this space. Another reason to use white paint on walls and trim is to downplay odd angles and architecture. 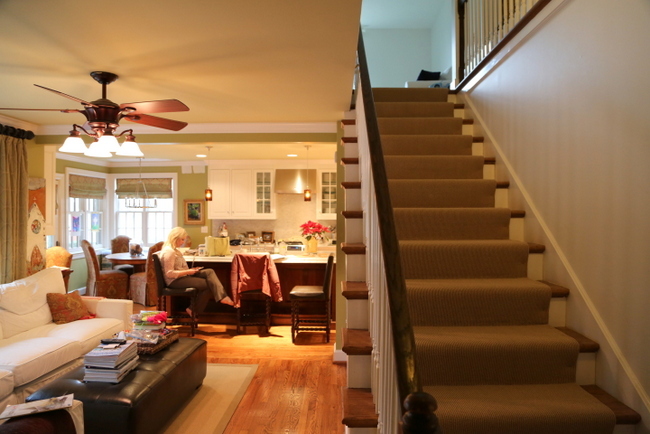 Although the area beneath the stairs was a very efficient place to tuck in storage and a television . . .
it looks so much better when it isn’t outlined by all the green wall paint that was around it previously. The change in paint colors drew more attention to awkward angles, and now the best white paint color for walls and trim make the architecture less choppy. 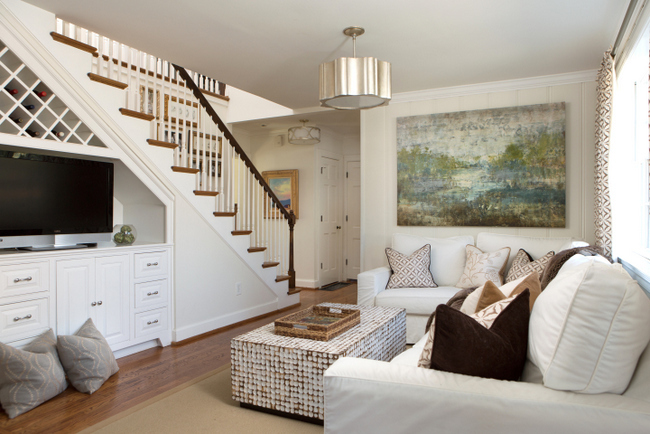 White is a great choice if you have a room with lots of natural light. I don’t typically use it in rooms with very little natural light, because it can look shadowy and dull. 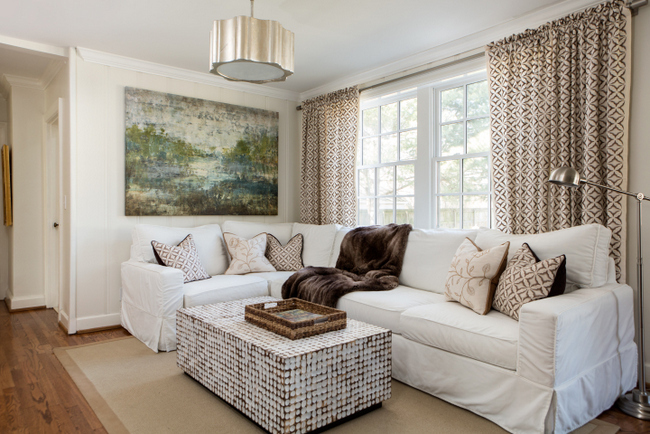 Fabrics with lighter backgrounds and metallics like polished nickel and wintergold lightened up this room, too. We kept the slipcovered sofa and natural fiber rug, but found a fun coffee table to replace the heavy dark one from before. The new art looks more in keeping with the fresh, new look of the space. 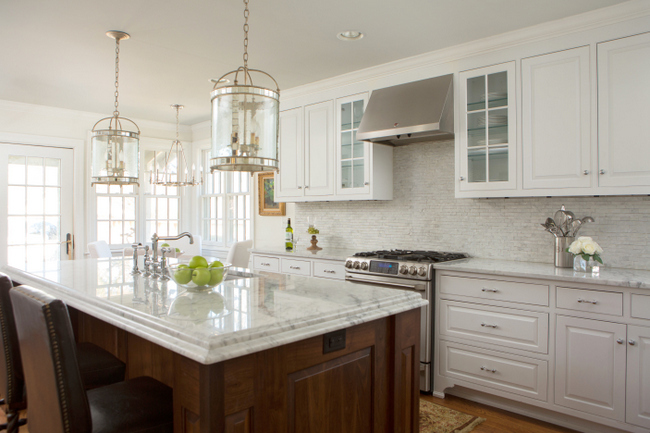 I chose these oversized lantern style pendants to take the kitchen up a notch. My client and her husband were initially worried the lights would be too large. 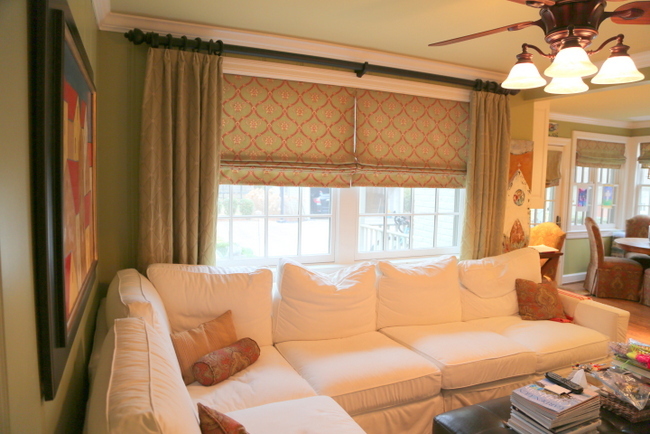 To make way for white washable slipcovers and BARE windows. With no privacy or light control issues in the breakfast nook, we opted to keep things as light as possible and forgoing window treatments here. Are you all confused now after reading the post dripping with sarcasm about Ben’s and Sherwin’s Color of the Year? Well, like I said before: there’s a time and place for everything, and this house proves it! So now my clients are moving to a new house, and guess what color they have chosen for their main interior color? White Dove, of course. They must think it’s the best white paint color for walls and trim, too! The new owner made an offer after being the first person to view it after staging, and happens to be a famous author whose book was #1 on the New York bestseller’s list for OVER A YEAR! That’s all I can tell you about that, but let’s just say she thinks this beautiful house has some divine secrets . . . 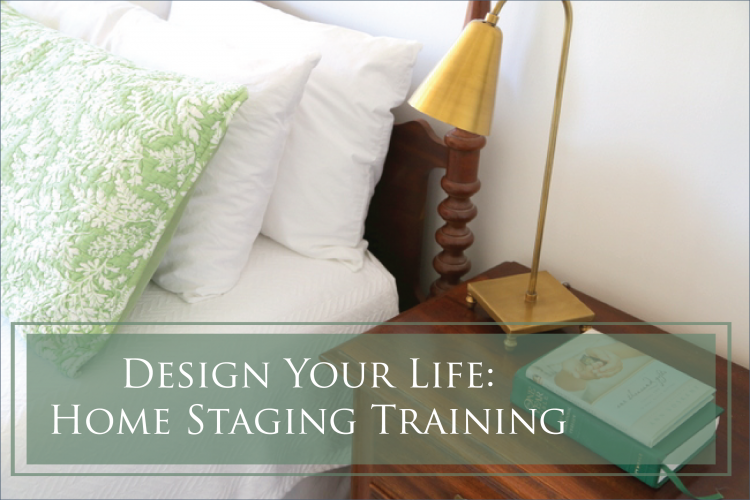 SPEAKING OF HOME STAGING, my RESA® accredited Expert Psychological Staging™ certification course is March 14-16. Spots are filling up fast, so make sure to register soon to secure your place. I’d love to meet you and look forward to teaching you everything I wish I had known when I started my own home staging business 13 years ago. If you’d love to break into the world of design, It’s a small investment that will make a huge difference in your future! 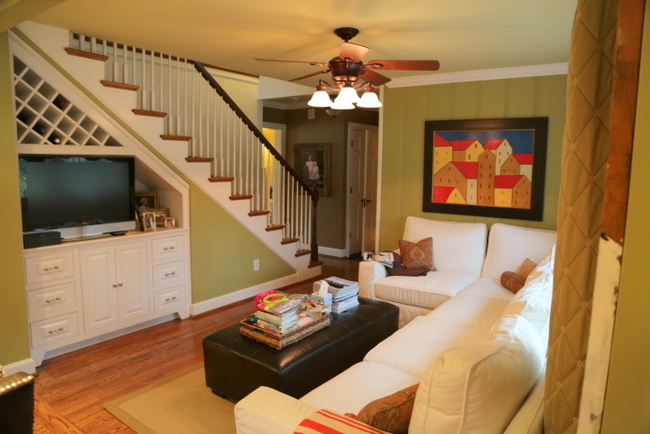 This entry was posted in Color Consultation, Design Intervention and tagged benjamin moore, best white paint color, color expert, designer, nashville, paint color, white dove, white kitchen, white living room, white paint, white trim, white walls. Once again, you nailed it in this space and in the entire home. Thank you for sharing your God-given talent with others….you are doing exactly what you have been called to do my friend, and it shows! Awww, you are so sweet to say that – thank you for the ongoing encouragement, it means a lot to me!!! 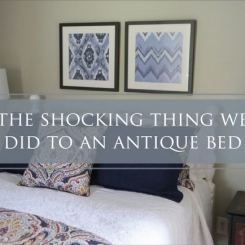 That is the most incredible before and after, especially since it consisted almost entirely of simply painting the walls white. What a beautiful home. That coffee table is so cool. Where did you get it, if you don’t mind sharing? I found the table at Bliss Home in Nashville. Thank you for the compliment! Thanks! I wish I could come to a staging class. It would be so fun to learn how to do this from you! I’d love to have you, Georgianna! Maybe someday! If white can look shadowy in a room without a lot of natural light, what would you suggest if I want to keep a light palette? I have a north facing bedroom with small dormer windows and to be honest, every color I’ve tried on there has looked different dingy and shadowy including a light yellow. We have Brookline Beige in there now and it has never looked good even when it was in style! Any suggestions would be greatly appreciated! The only color that I’ve found that will “lighten” a dark room without natural light is yellow. I like Philadelphia Cream and Hawthorne Yellow (both Benjamin Moore)in spaces with limited light. My best advice is to add lots of artificial lighting in the way of lamp light and maybe sconces. GREAT example photos Kristie that clearly show the power of white! WOW!!! I love it. You do such beautiful work. Could you do a post for the best white for an exterior paint? My house has charcoal roofing and vanilla bean ( which looks creme) painted brick. If I paint dove white will that be too light since it gets full sun? thanks! I like a whiter (vs. creamier) white on exteriors with a gray roof. Creamier whites are better with brown roofs. So I think you definitely could do White Dove on the exterior as long as there isn’t creamy stone or unpainted brick to deal with! Simply gorgeous! I love the transformation. Beautiful! Hard to tell though what color their cabinets are ?One question I have is; do you need to be careful of white dove walls against white stock cabinets? Is it ok to have white dove walls and a stark white or linen white stock cabinets? Gosh this post was from two years ago, but it’s resonating with me now! We’re painting our dreary beige walls and trim white. I’m thinking about White Dove for the walls and Decorator’s White for the trim and cabinets. Are they too close per your comment above? I’m really nervous about choosing the wrong combo. I want clean white trim (we have a lot of it in baseboards and molding) but a warmer white wall. Thank you in advance! It may work, but your walls will read yellowish in comparison to the Decorator White. One combo I do like that might fit your bill, would be BM Chantilly Lace for cabinets/trim and Classic Gray (reads like a warm white)for walls. Good luck! Awesome, I think it’ll look great! 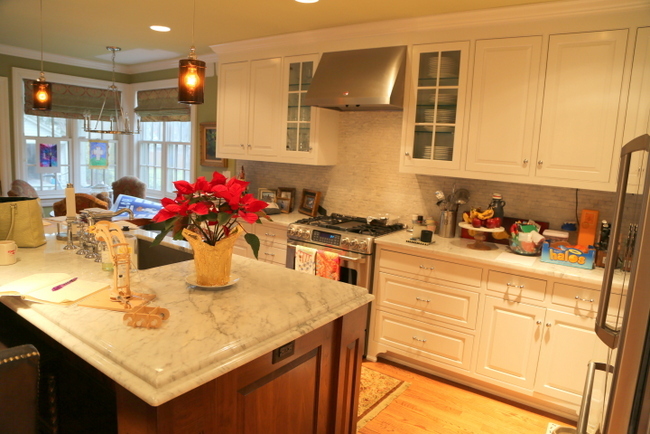 One final question I promise…Would you choose semi-gloss for the cabinets/trim over satin? Depends on the look you want, Jenifer. Most people want a factory-finish look, so they go with satin. I prefer semi-gloss because it will better match the trim and looks less modern (I live in a historic home). WOW! We’re building a new home so you’ll be hearing from me in the fall! Thank you so much, Robin! I love how paint can be so transformative!! Absolutely a stunning and inspirational make over! Thanks, Ginny – I enjoy your makeovers, as well! Have a great week! This looks so nice and what a transformation! We are about to paint and now I’m second guessing our choices. We thought it would look good to pop the white trim but now I’m wondering. Our home does have a lot of natural light. The color on the walls now is BM Navajo White with a bright white trim (don’t know the color). I’ve always felt like the Navajo was a little bland and too yellowish. We are looking at SW Simplify Beige or SW Sand Dollar. Any advice? Yet another SO gorgeous project. I would have thought those lights would be too large, also, but they are PERFECT! Great job, Kristie, and thanks for sharing it. I learn so much from you! Thank you, Carol! I love how large light fixtures make a statement, and these really took the kitchen to the next level! Lovely job as always! 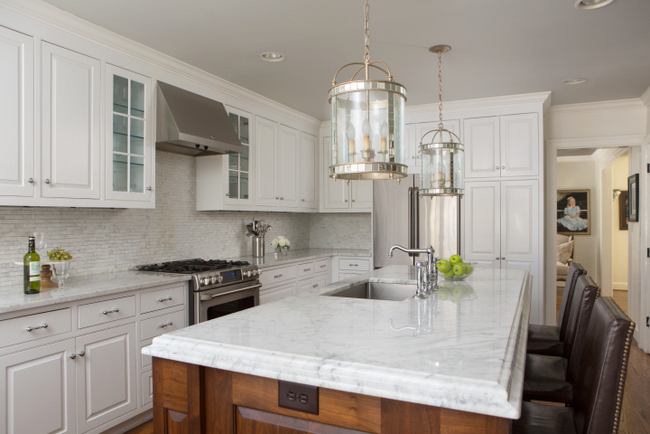 Would you share where the source for pendant lighting in the kitchen? Those lights are from Graham’s Lighting in Franklin, TN. One of my go to whites also! Especially for kitchen cabinets. The rooms looks so fresh and modern. Great job as usual. These before and after photos are amazing! Feel and look so fresh and clean. Great job! What do you think about BJ White Chocolate everywhere? So far it’s just on trim & I’ve got a ridiculous number of colors that have got to go in order to get ready for selling. Thank you for simplifying what can often be an agonizing choice, Christie. And I feel extra lucky, since you’ve featured my favorite, White Dove! I love the idea of using the same color, but in different finishes — genius! As a color lover, I’ve been through the stage (pardon the pun, lol) of painting each room a different wall color…but now I want more of a neutral backdrop with colorful art and accessories. Hi Kristine, would you recommend white or ivory as a sofa colour against the white dove? Thank yiu for your beautiful work! These slipcovered sofas are a bit whiter than White Dove. Either is fine, so long as you repeat each of the whites you use a few times in the space. In other words, if the sofa is super white and the walls are off-white, make sure there are other things in the room that are super white and off-white, so that the mixing of the whites looks intentionally. I hope that helps! 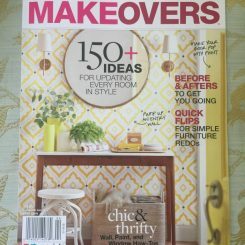 Great article, I am working on a plan for painting our fairly new-to-u- house. 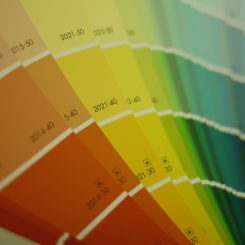 Your Essential Paint Color guide is invaluable! I’m ready to get some samples to test this week. I cannot wait to paint the trim – for some reason the people that built this house chose Rocky Road for all the trim, doors, laundry cabinets and mudroom lockers. It is so icky! Pretty much ANY white would have been a better choice. advise to paint ceilings the same color too or lighter? Same color, but in flat finish! What if you have a lot of millwork and coiffured ceilings? What finish would you recommend as the ceiling is actually moulding as well? All millwork/architecture would be semigloss trim finish. For a coffered ceiling, I’d do white, all-gloss, on the whole thing (no flat ceiling paint)! Hey! Thanks for your post! I’ve been debating on doing this color in my dance studio and could not find any information about having two different white or one for the walls and trim. So just to verify, you painted the ceiling, walls, and trim ALL in White Dove? Just in different sheens (flat, eggshell, and gloss?). Thanks again! Looks fabulous! Ashley, yes – all the same color, but in different sheens! Glad to help! Eggshell/Semi is my vote, Kim! Love this, I’m inspired! What is your take on Sherwin Williams Alabaster? Also, is the ceiling painted the same white as well? What type of finish? Thank you! This room is gorgeous and just what we would love. I’ve seen so many great white rooms online and usually the paint color listed, but no one ever mentions the color/brand of flooring they use. Could you tell me the flooring used in this room or one that would go along with this type of room. These are the original hardwood floors from the 1940s. I love what you’ve done with white. I’m currently having my kitchen cabinets sanded and prepped for painting. I want to paint the cabinets white. New granite counters are going to be grey/white-ish color. Walls are going to be a true light grey. I’m stuck on choosing the right shade of white for the cabinets. Can’t decide between BM Chantilly Lace or BM white dove. I’ve been warned about going too stark white on the cabinets. But I don’t want the cabinets to look too yellowish or beigey either. Any advice you could offer would be immensely appreciated. 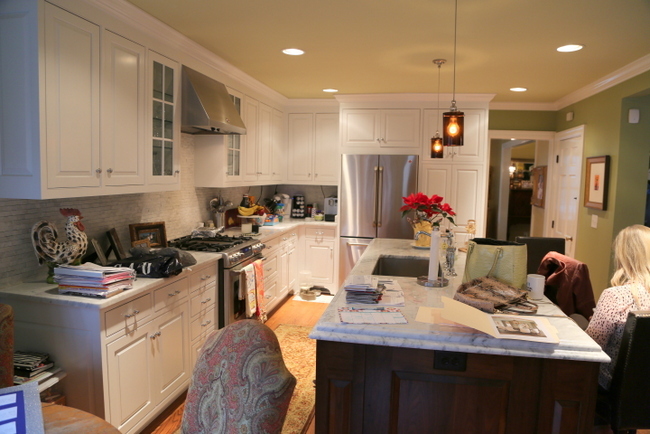 I have an easy answer for you – paint your cabinets the same paint color as your trim. If you don’t, one will look dirty in comparison to the other! Hi, I’m so glad I found this site! I just booked painters to do dove white in all my walls, but I have white cabinets. My trim is simply white. So should I paint my cabinets simply white or is that too Stark? I saw an Instagram post of someone using Acadia white on walls of kitchen with white dove cabinets and white dove walls everywhere else. My house is open concept so I’m not sure how I’d do that. Totally stuck. 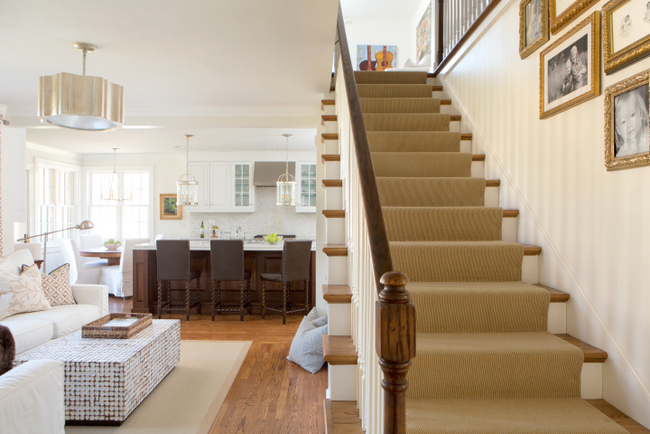 Do you use Benjamin Moore Advance paint for trim? So much nicer, however, the darker lighting and (every day living) clutter in the before pictures contribute to a heavier feeling. Would be nice to see the clutter cleared in the before pictures to get a truer sense of change. That said, the rooms look fabulous in white. Thank you for your comment! If you notice, the photos were taken at about the same time of day (you can see the light outside in both are similar). The reason why the room was darker is because of the heavier window treatments that covered the upper portion of the windows and because of the dark wall colors. The lighter colors of the walls, art, window treatments, and accessories made the whole space feel lighter than before. What about the color of the ceiling? Dove in flat? Love the before and after! 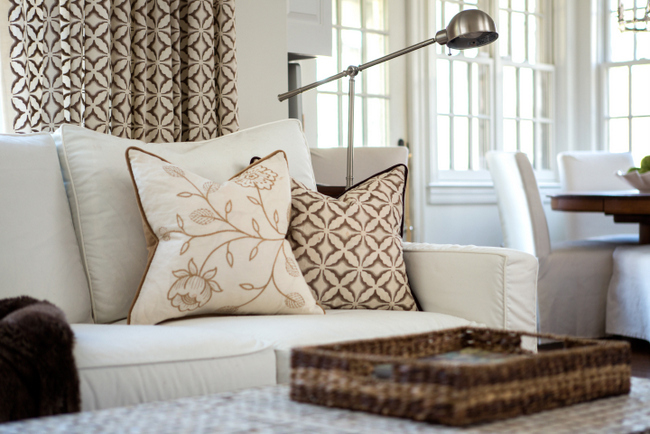 Can you tell me the fabric name you used for the pillow and curtains? I think they’re great! hi Kristie, would your tip for painting the windows black,”macara tecnique”,look pretty with an all white dove painted living room as you described ? also… i was thinking of putting a saphpire colored sectional in the white dove living room, would that match or do you have a better idea? thank you! The black eyeliner on the windows would look stunning with a room painted white. I’ve done it! I think a jewel-toned sofa would be gorgeous – just be sure to repeat some of that color in some art or fabric elsewhere in the room, and it should be lovely!!! Thanks for reading, Judy. Could you tell me the paint company that makes Leeds Castle paint color -you posted on the LP siding company website regarding paint colors that go with gray roofs. Thank you. Love your website . The closest match to Leeds Castle is Benjamin Moore White Dove! Would you mind sharing the brand and name of the fabric used on the curtains? These are only available to the trade – they aren’t retail, sorry! What do you think about all sheens being eggshell? Ceiling, walls, trim. Bad idea? Yep, bad idea. It’ll look builder grade if you do that. It’s the cheap, easy way to go and that’s how it will look – like you just spray painted the entire room the same. You need sheen variations for depth and dimension. Getting ready to paint exterior of new construction home near the ocean and really want to go white on white. It has a blue roof and two cupulas with blue roofs. Do you think Dove white would work? If so what sheens would you suggest? also any sherwin Williams suggestions? Ben Moore White Dove would be great – Sherwin Williams Pure White is similar. You don’t need to do different sheens on exterior trim and body – most painters do an exterior flat because the light reflecting off sheen can be glaring on an exterior.